This post is a part of the Fantabulous Valentine's Day Favorites blog chain put together by a great group of bloggers. The theme this week is Favorite Valentine's Day DIY and Craft Ideas. Be sure to check out all the great ideas shared at the end of this post! You can also link up any family friendly Valentine's Day post you have on the linky at the bottom of this post! I talked the other day about how much I enjoy volunteering in Brady's classroom to lead a craft. The first one I did was in the first grade classroom last year and it was these super simple heart-shaped glasses for Valentine's Day. 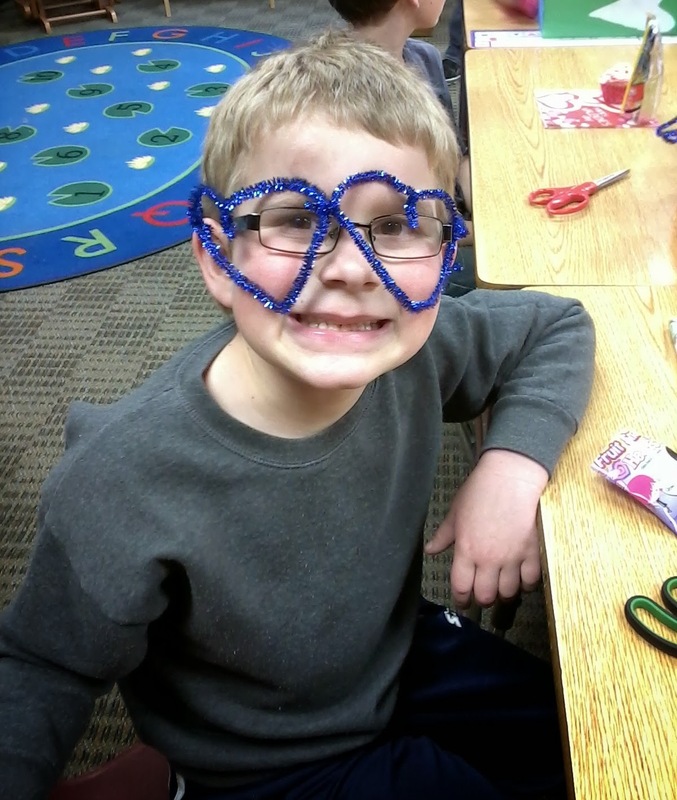 I loved the glasses craft because it's fun, easy, fast and gives you something you can play with and keep. It was very easy for the first graders to follow. All you need are 3 pipe cleaners per set of glasses and a pair of scissors. You can mix and match pipe cleaner colors, use all one color or get metallic like we did! Take the first pipe cleaner and bend it in half to make a V, then twist around to form the top of the heart. Repeat for the 2nd heart. Cut a small piece of another pipe cleaner to attach the two hearts together where the glasses will sit on the bridge of the nose. Cut 1 more pipe cleaner in half and attach those two halves to the hearts for the ear pieces. Bend the back end down to wrap around the ear. At Make and Takes, she has a mini version of the glasses too. Brady displaying the pair he made. The kids loved seeing each other in their glasses. This pair I whipped up this week in a very short time. Interested in more fantabulous Valentine's Day DIY or Craft ideas? Check out any of these posts by clicking on any of the links below! Still want more? Head to our Pintabulous Mom's Valentines Day Board! We would love you to link up any Valentine's Day post that you have. (They do not have to be craft/diy posts, but we would ask that it would be family friendly.) Come back next week to see our favorite Valentine's Day food recipes where you can link up again! We would love it if you would like to get our button to remember to come back or to put it on your party page, but it is not a requirement! Thank you! :) I love fun easy crafts the best. Those are so cute! And I love the metallic pipe cleaners. I bet the kids thought those were cool! I'm amazed all the different types of pipe cleaners they have. These are so cute!!! I didn't know pipe cleaners came in shiny version.. It was new to me too and the kids loved them! Some did two different colors, some the same. Super cute! I bet the kids had a great time with these glasses. :) It just goes to show that kids can have a great time with out spending a lot of money if you just use a little creativity. They enjoyed seeing the teachers and me in them the most, ha! Those are so cute and my kids would have a blast making and wearing them. Thanks for sharing! Thanks Amber! Hope they enjoy it and thanks for stopping by! The heart shaped glasses are brilliant! Easy and so cute! Oh Brady! You are so cool. LOL, thanks. I think he's pretty much convinced of that most of the time, ha! Sweet ideas! I love hearts and sparkly pipe cleaners. It is so much fun take a simple material and make it marvelous! Hi Steph. Very cute, I bet your little guy really liked this. Isn't he a cutie. Looks like he loved the glasses. Easy, fun little project. I love all the fun pipe cleaners they make these days. When I was a kid there was white.. and literally you bought them at the tobacco store where people bought pipe cleaning supplies.. we made so many fun things with pipe cleaners and yes, cigar boxes.. the stores would give us all these things for free too! I still remember the pipe tobacco smell and exactly where the store was and the friends who would go in with me way back when. LOL, I didn't realize you could only get them at tobacco stores. I was a little overwhelmed by all the choices! What a cool memory you have. Those are so cute! Looks like a young Elton John!! Oh that's funny, he kinda does! I sure hope they are a hit. They seemed to especially love seeing adults wearing them. We've made pipe cleaner glasses before, but not HEART shaped glasses, the kids'll love them! We should make these at our house. My daughter loves to wear random sunglasses. She has a pair of play glasses that have the lenses out of them that she wears around the house...it's so funny! Oh how fun! I wonder if you could somehow glue some colored clear paper or colored plastic wrap in the lens part of these? I love the heart shaped glasses a lot. Your son looks so funky and happy wearing them on. I love the you do the crafts for Brady's classroom. They look fun! I'm sure the imaginations run wild. Thanks Jill. I have such a blast every time, it's an eye opener and they always amaze me those kids. Those glasses are adorable! I can't believe that Valentine's Day is right around the corner, but it is! Oh my gosh, I know it! I need to get a few things for the boys! The Valentines glasses are very cute and easy to make! Thanks for posting this. CUTE ideas! Thank you for sharing with all of us! I truly enjoy your comments and love to interact. Be sure to check the "notify me" box below to see new comments and replies to your comment! Thank you! I'd like a soda? Wait, no, a pop. Or is it coke? This is the 205th post! I'm a Christian, mom to a spirited 8-year-old boy & work for our family business in Kansas. I've lived in a city of 1 million and now a town of less than 1,000. From the Burbs to the Boonies is about life in small-town USA, frugal living, healthy cooking, encouragement parenting, co-schooling or supplementing public school education, modern day hunting and gathering, living by faith and getting families outdoors.